MAZINGER Z is a huge robot constructed with a fictitious metal called the Super Alloy Z, which is forged from a newly-discovered element Japanium mined from a reservoir found only in the sediment of Mt. Fuji. The robot was built by Professor Juzo Kabuto as a secret weapon against the forces of evil, represented by Mechanical Beasts created by Dr. Hell. Dr. Hell was a German member of a Japanese archaeological team that discovered ruins of a lost pre-Grecian civilization on an island named Bardos. This civilization was loosely-based on the ancient Mycenae Empire. Their findings include that the Mycenae used an army of gigantic steel titans. Finding prototypes of those titans underground which could be remote-controlled and realizing their immense power on the battlefield, Dr. Hell goes insane and had all the other scientists of his research team killed except for Professor Kabuto, who manages to escape. The lone survivor goes back to Japan and attempts to warn the world of its imminent danger. Meanwhile, Dr. Hell establishes his headquarters on a mobile island and plans to use the Mechanical Beasts to become the new ruler of the world. To counter this, Professor Kabuto constructs Mazinger Z and manages to finish it before being killed by Dr. Hell’s minion: Baron Ashura, a half-man, half-woman being. As Professor Kabuto is dying, he manages to inform his grandson, Kouji Kabuto, about the robot and its use. Kouji then becomes the robot’s pilot and from that point on, battles both the Mechanical Beasts and the sinister henchmen sent by Dr. Hell. I received an e-mail from two of my best buddies on September last year. 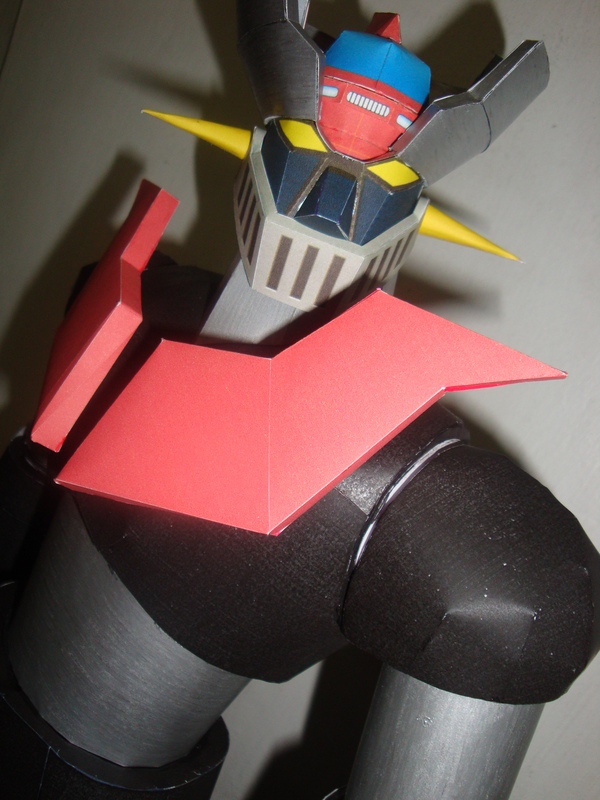 It contained a file of a pattern of Mazinger Z. I went to my favorite shop at the mall to have these printed so I could assemble it immediately. It took me almost six months to complete! I really took my time to finish assembling this particular paper model, depending on my mood that time, never realizing at first on how big this figure would be. But when I get to assembling the lower torso, I got anxious. It was going to be BIG. The finished product was 26 INCHES TALL. It really freaked me out! But after that, I was rather quite pleased with the outcome. For those who want to download and assemble this truly magnificent paper toy, I am very sorry. The file where the pattern was saved got corrupted. I am pretty sure there are other places over at the internet where you could get the file though. For me, I am very much content with what I have assembled and this one is for keeps.